Former FBI Director James Comey is in deep trouble — and he could have just hours left to breath. Thursday, the hammer of justice may finally come down on him and the alleged anti-Trump (and pro-Hillary Clinton) agents in the FBI. In a remarkably public clash of wills with the White House, the FBI declared Wednesday it has “grave concerns” about the release of a secret memo on the Russia election investigation that President Donald Trump wants released. The FBI’s panicked public statement, its first on the issue, laid bare a Trump administration conflict that had previously played out mostly behind closed doors in meetings between top Justice Department and White House officials. In other words, the memo’s release will make the FBI’s investigation into the 2016 presidential election look very, very bad. 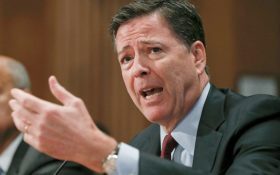 If it shows the bureau under Comey acted illegally against Trump — and in favor of Hillary — it could even lead to calls for the former FBI director’s arrest. Further complicating the memo’s release, the top Democrat on the House intelligence committee said late Wednesday that his committee’s vote to release the memo was now invalid because there were minor grammatical changes by the Republicans who wrote it. California Rep. Adam Schiff said in a letter to House Intelligence Committee Chairman Devin Nunes that committee Democrats had discovered minor edits that were made after the panel voted Monday to send it to Trump for review. Sponsored: Is this how Ronald Reagan cured his cancer? Trump himself already has urged the release, and it is widely expected to be made public early Thursday. The memo is part of an effort to reveal what Republicans say are surveillance abuses by the FBI and the Justice Department in the early stages of the investigation into Russian meddling in the 2016 presidential election. The FBI’s stance on the memo escalates the dispute and means Trump would be openly defying his hand-picked FBI director by continuing to push for its disclosure. It also suggests a clear willingness by FBI Director Christopher Wray, who in the early stretch of his tenure has been notably low-key, to challenge a president who just months ago fired his predecessor, James Comey. The FBI statement came the day after Trump was overheard telling a congressman that he “100 percent” supported release of the four-page memo. White House spokeswoman Sarah Huckabee Sanders told CNN Wednesday that a legal and national security review of the document was continuing. Trump had not read the memo “as of last night prior to and immediately after the State of the Union,” she said. Sponsored: Hillary Clinton and Charles Manson have WHAT in common? The White House counsel’s office has been in possession of the memo, officials say. The National Security Council is leading a review, which will also involve the White House legal team. The vote to release the memo was unprecedented in the committee’s history, indicating it’s severity. The panel usually goes out of its way to protect classified information in the interest of shielding intelligence sources and methods. In the hours before the Monday vote, Rosenstein and Wray warned Kelly that releasing the memo could set a dangerous precedent, according to a person familiar with the conversation. Rosenstein also told Kelly the memo didn’t accurately characterize the FBI’s investigative practices, the person said. After those complaints, Wray reviewed the memo over the weekend. Rep. Trey Gowdy, R-S.C., who was with him when he reviewed the memo, said the FBI director did not raise any national security concerns.